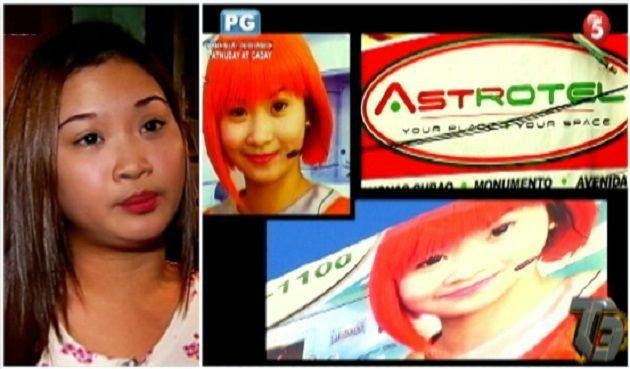 A former employee of Astrotel Hotel turned to legal actions after the company had used her photo in their advertisements without her permission. Arriane Foronda, the model used in Astrotel’s billboards and posters, had asked the TV 5’s Tulfo brothers for help related to the issue. In T3 Enforced, a TV5 news show, Foronda presented her case and shared that she had been a receptionist for four moths in the said hotel. During her stay on the job, she was asked have her photo taken. She complied understanding that the photo will only be used in the company’s bulletin board to show the new employees the standard uniform. After she resigned from the company in May 2014, she was surprised to see her photo in the hotel’s print ads posted in billboards and posters put up in various parts of Metro Manila. Foronda also stated in her interview that she had received various comments and taunts because of the ads. She stated that she wants the ads containing her photos to be put down since she never gave her permission to the company to use her photo in the first place. She described how she was put to shame after the ads came out. T3 team went around the streets in Metro Manila and showed that the billboards are indeed with Foronda’s photo. Astrotel Hotel admitted that the model is Foronda but according to the hotel’s supervisor, Marlon Hermosa, as a formal employee, she should know that her photos could be published in tarpaulins and other ads. They promised to take down the ads s soon as possible.